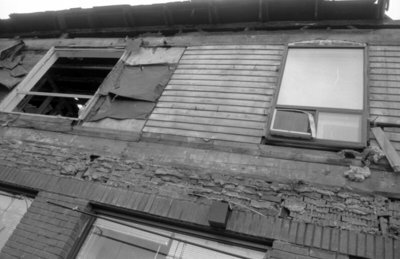 A black and white photograph of 204 Brock Street South after it was destroyed by fire. View is of the second floor windows on the side of the building taken from Colborne Street. This row of stores is located on the southwest corner of Brock Street South and Colborne Streets. 204 Brock Street South, September 26, 2005, Carl Ferencz. Whitby Archives A2013_027_005.